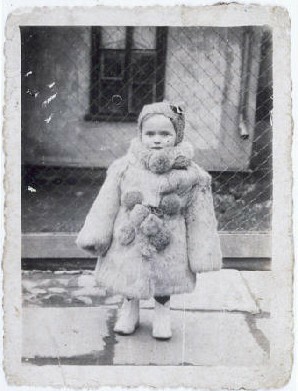 Portrait of three-year-old Estera Horn wrapped in a fur coat. Chelm, Poland, ca. 1940. Estera was born in January 1937. Her father was killed soon after the Germans invaded Poland. Estera and her mother, Perla Horn, were forced into the ghetto in Chelm. At the end of 1942, during the liquidation of the ghetto, Perla and Estera escaped from the ghetto. They hid in nearby villages. In late 1943, Perla asked a family in Plawnice to take care of Estera. Perla tried to hide with a group of Jews in the nearby forest, but they were discovered by Germans and killed. In the spring of 1944, the family began looking for a new home for Estera (who had been given the name Marysia). She was placed in Warsaw, and eventually transferred to an orphanage in Krakow.